The top U.S. general for homeland defense told a congressional committee Tuesday that he sees no military threat coming from the southern border with Mexico. 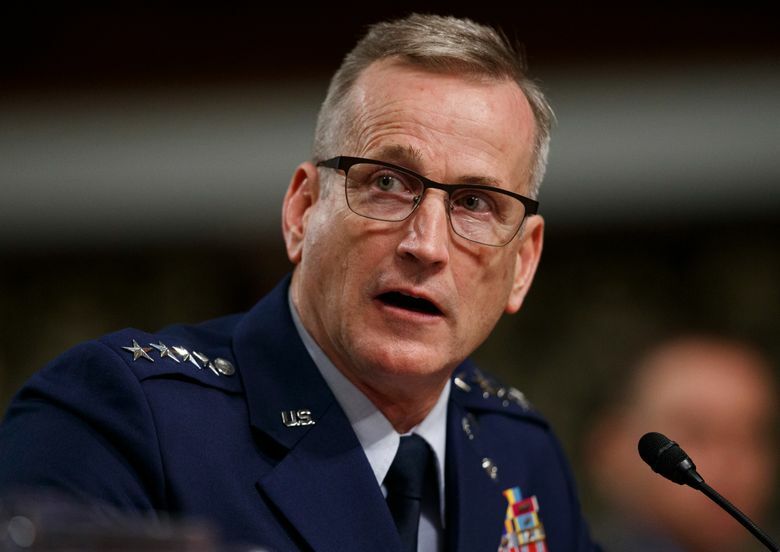 WASHINGTON (AP) — Under pointed questioning from senators, the top U.S. general for homeland defense said Tuesday that he sees no military threat coming from the southern border with Mexico, but his focus is on “very real” threats from China and Russia. Air Force Gen. Terrence O’Shaughnessy, commander, U.S. Northern Command and North American Aerospace Defense Command, told a Senate committee that proposed barriers along the U.S.-Mexico border could increase security against any potential military threats coming from the south. But he said Russia’s advancements in training and capabilities, and its intent to hold the U.S. at risk, present an urgent threat to America. President Donald Trump has declared a national emergency along the southern border to fund his proposed wall, and he plans to use Defense Department funds from military construction and counter-drug programs to pay for it. Members of Congress are challenging that. Democratic senators on the Senate Armed Services Committee peppered O’Shaughnessy with questions about the need to divert the money from existing projects and questioned the validity of a national emergency declaration. “I’m concerned, very frankly, that this administration is politicizing our military and militarizing our immigration policy – in effect, using the troops under your command as political props, both in terms of declaring a fake emergency but also compromising our potential security by diverting them away from other assignments and missions that are absolutely necessary,” said Sen. Richard Blumenthal, D-Conn. The meeting comes as the Democratic-controlled House was planning a vote Tuesday to revoke Trump’s emergency declaration, and send legislation to the Republican-held Senate, where it would take only a handful of GOP defections to pass it. O’Shaughnessy, who visited the southern border on Saturday with Acting Defense Secretary Patrick Shanahan, was careful to defer any assessment of the southern threat to the Department of Homeland Security and Customs and Border Protection. He said that those agencies believe that more fencing can impact the movement of drugs across the border. Sen. Tim Kaine, D-Va., questioned whether Congress should allow Trump to use Pentagon money for a non-defense emergency. Sen. Dan Sullivan, R-Alaska, argued that the shipment of illegal drugs from Mexico into the U.S. has caused tens of thousands of deaths, and that it constituted an emergency. But he also endorsed O’Shaughnessy’s assertion that Russia’s expanding fleet of icebreakers in the Arctic present a serious threat, and the U.S. needs to increase its capabilities there. The U.S. Coast Guard currently has one working Polar-class icebreaker ship, but there’s funding in the Defense Department budget to begin building more. Sullivan said the poor condition of the U.S. ship is a disgrace, and the U.S. needs more ability to counter Russia and China in the arctic.